The best bike security devices are the ones that render the bike unusable in the event that they are broken or otherwise tampered with. 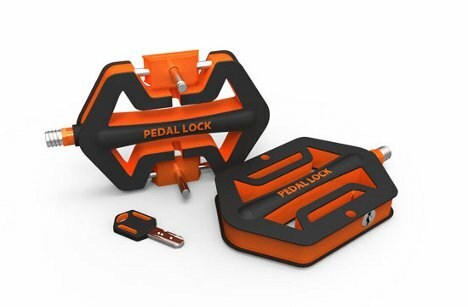 The Pedal Lock is a pretty clever invention that does just that by using the bike’s pedals themselves as the security mechanism. The design, thought up by Cheng-Tsung Feng and Yu-Ting Cheng, requires you, the bike rider, to remove your pedals when you get to your destination, wrap them around both the tire and a bike rack, then lock them in place. 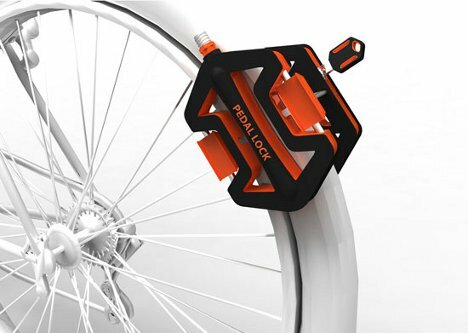 The obvious flaw in this design is that seasoned bike thieves won’t be slowed down by missing pedals. They would break the plastic pedals and then just put a new pair on after throwing your bike into the back of their truck. But maybe for quick trips in safe areas, the pedal locks would prove to be enough of a deterrent for all but the most determined of thieves.